There are so many endless gifts to behold in Florence, it would take a lifetime to appreciate and see them all. Last week I became a member of the Amici degli Uffizi, which provides me with unlimited access to the museums in Florence. And I don't have to wait in the tourist lines. When I purchased my annual passs I wondered which museum I should see first. It was such a beautiful day today, that I decided to go to the Palazzo Pitti Boboli Gardens and headed there on my bike in the late afternoon, to avoid the mid-day sun. I had never toured the gardens before, except to see the opera a couple of times, which only allows you to see a small area of the gardens. As I approached the entrance of Palazzo Pitti there were hundreds of people waiting in line and I just walked up front and showed my pass. Upon entering the garden gates, I was immediately stunned by the enormity and splendor that I was beholding in front of me. As I started my passeggiata I soon realized that I have found my Central Park in Florence, a place where I can escape to enjoy the serentiy while taking in such classic history displayed in the sculptures and fountains that lace these magnificent gardens. I could never compete with the hundreds of writers who have described the splendor of these gardens. It has all been said before. But at every angle, at every step, at every turn there was a new and striking vista to behold, a new piece of history to absorb. I took so many photos, that my battery was fully spent within a short time. Before I realized it, 3 hours had already passed and I had just skimmed the surface. There was so much more to see and it was closing time. 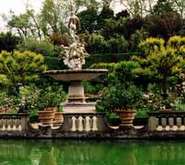 Like Central Park, Boboli is not a place to "see" but to "live in". I'll be coming back often to stroll, to connect with nature and to appreciate the history behind the glorious sculptures. I discovered that the Nettuno della Fontana dell'Oceano at the Isolotto is a copy of the original crafted by Giambologna, now at the Bargello. I am starting to appreciate Giambologna's style more and more as I see his works in other parts of Florence, such as Orsanmichele, Piazza Signoria and Piazza San Marco. The first time I went to the Bargello, I didn't know who Giambologna was, so when I saw the original Nettuno, I couldn't fully appreciate it. But now that I have seen the Nettuno where it originally stood, it has a new meaning to me. I will have to go back to the Bargello and look at the original again to appreciate it even more. Upon leaving the gardens, I could hear the sweet sounds of a baritone singing a Verdi aria in the distance. As I followed the stunning voice, I was delighted to discover that a free operatic concert was just begiining in the Grotta del Buontalenti., one of Giovanni Battista's masterpieces. What a thrilling and spontaneous surprise. The concert featured a baritone, a tenor, a bass, a mezzo and a soprano, who were part of a Korean opera company on tour in Italy. The voices were so outstanding and I enjoyed an absolutely delightful evening that I will never forget. Days like this are a gift.